With more than three months to go before Election Day, most voters already feel that there’s little left to learn about the presidential candidates. When it comes to Barack Obama, 90% say they already pretty much know what they need to know about him; just 8% say they need to learn more. A substantial majority (69%) also says they already mostly know what they need to know about Mitt Romney. 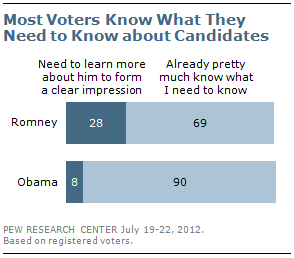 Only about a quarter (28%) say they need to learn more to get a clear impression of Romney. Combining these two questions, fully two-thirds of voters say they already know as much as they need to about both presidential candidates. When it comes to specific details of Romney’s background and experience, 41% of voters say they would like to learn more about Romney’s record as governor, 36% would like to learn more about his tax returns, while 35% want to know more about his record as chief executive of Bain Capital. Far fewer want to hear more about Romney’s wealth (21%), his family and upbringing (19%) or his religious beliefs (16%). The latest national survey by the Pew Research Center for the People & the Press, conducted July 19-22 among 1,001 adults, including 798 registered voters, finds that overwhelming percentages of Democrats (93%), independents (91%) and Republicans (89%) say they already know enough about Obama to form a clear impression of him. By contrast, Republican voters are more likely than Democrats to feel they need to learn more about Romney to form a clear impression of him (34% vs. 21%). About three-in-ten independents (29%) say they feel they need to learn more about Romney. Democratic voters (56%) say they want to hear more about Romney’s tax returns – in fact, Democrats are more interested in this than any other part of his background tested. 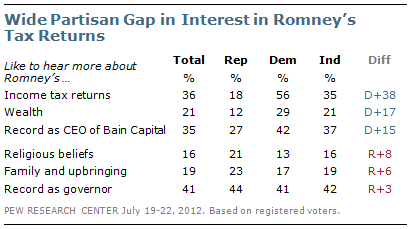 By comparison, 35% of independents and just 18% of Republicans want to hear more about Romney’s tax returns. More Democrats than Republicans also say they want to hear about Romney’s wealth (29% vs. 12% of Republicans) and his record as CEO of Bain Capital (42% vs. 27%). There are only modest partisan differences the percentages interested in hearing more about Romney’s religious beliefs, his family and upbringing and his record as governor of Massachusetts.